One golden rule for people who want to get on in politics is to keep their traps shut in August. Bill Deedes was a British Conservative Party politician, army officer and journalist; he is to date the only person in Britain to have been both a member of the Cabinet and the editor of a major daily newspaper, The Daily Telegraph. 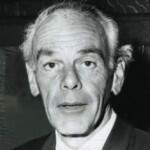 Deedes began his career as a reporter on the Morning Post in 1931, joining the Daily Telegraph when it took over the Post in 1937.